Finally dropping a line with an update for Ilsa !! 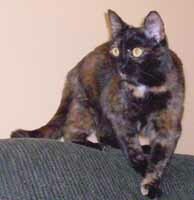 Ilsa was one of 4 kittens rescued by AWA in the summer of 2005. A kindly woman noticed the four injured kittens struggling for life at a truckstop and called AWA. The kittens were found and after much care, attention and some surgery all were healthy and ready for new homes !! After some difficulty and disappointment trying to find a healthy kitten through a local pet store, I was searching for an alternative and was made aware of the great work of the Animal Welfare Association at my local Vets. 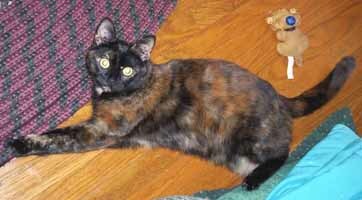 I came home and went directly on the website, scanning all the beautiful cats and kittens, but one jumped off the screen at me, a pretty tortoiseshell named Ilsa. I spoke to Helen and it was then I learned of this kitten's very rough start. My husband, 2 little girls and I went that evening to see her and of the 5 kittens fostered in the home, she alone came out to play with us, and we knew she had chosen US !!! Two days later Ilsa joined our family and the rest is history. Ilsa's favorite games include 'get you' (hide and seek), 'chase' (anything that moves !!) and strangely, she loves to watch the water in the toilet bowl ???!!!!. My kids think this is hilarious !! She is MUCH loved !! Ilsa loves to watch me feed her fish friends every night before bed and visits me in my bed in the morning ! !